A couple days before our trip to SJO we thought it might be prudent to see if the advertised “free airport shuttle” would in fact be valid for our late arrival time, 11:50PM, even though it was advertised as 24 hour. Contacting the hotel we were told that it was. Did we make reservations with Interbus? Hmm, no. First I heard of that. Reading the print on the website one can see that the shuttle reservations can be guaranteed only if made within twelve hours of making the reservation. Didn’t know that. It was never mentioned. Maybe because we booked through Trip Advisor. A very helpful employee showed me how to reserve the shuttle from the Adventure Inn website. Filling out the online form was a breeze, but the confirmation number I plugged in didn’t work. An error message said to contact the hotel. So I did. They determined that booking through a 3rd party with a 3rd party reservation number was the reason. So I was promptly emailed a link with the “correct” reservation number already plugged in. How neat is that! So reserving the shuttle went smoothly enough. An Interbus email confirmation said a uniformed driver would be waiting just outside the arrival area holding a sign with our name on it. That sounded great. But the plane was late leaving HOU and arrived almost 1.5 hrs late. I had assumed that the shuttle people would be experienced enough to keep an eye on airline schedule changes. Maybe. Maybe not. No uniformed driver holding a sign with our name on it was to be found. And we DID look. Attempts were made to phone Interbus by two different people, but “no contesta nadie!”. By the time we gave up on the Interbus shuttle all the cabs had left the arrival area. Our porter found someone in a van labeled “Turismo” that would to take us to our hotel. I was vaguely aware that upon arrival a number of cabbies were holding up signs that said something to the effect “Legitimate Cab”. But the time was fast approaching 2AM and all we wanted was to get to the hotel. We weren’t long out of the airport when we both began to feel uneasy. One reason is that there were two “drivers” sitting up front. And we started going down smaller roads. And the hour was late with few people out and about. The driver said up front that the trip would take about 20 min. but in fewer than 10 min we were at the hotel, all safe and sound. The Turismo driver, we noticed, had no taximeter. Well, he wasn’t a taxi. Just took advantage of an opportunity and charged us what turned out to be 2X normal cab fare! The desk clerk acknowledged the routing. She said that t the hotel would refund our money if we could get a receipt. But the clerk was picky about what constituted a receipt. The driver wrote something out on a piece of paper but that wasn’t good enough. Same thing for the back of his business card. I really began to get the impression that we were just getting lip service. Guess I’ll never know for sure. Our room was not a disappointment. Nice and quite spacious. We were so tired we didn’t notice, or look for, an A/C until morning. With San Jose’s elevation being several thousand feet, the night was comfortable enough without it. The next morning the desk clerk on duty was familiar with the events of a few hours earlier. He brought the subject up himself when he learned our room number. Seems the boss told him to refund our $25! Now that’s a good way to start our day! We’re once again happy campers. 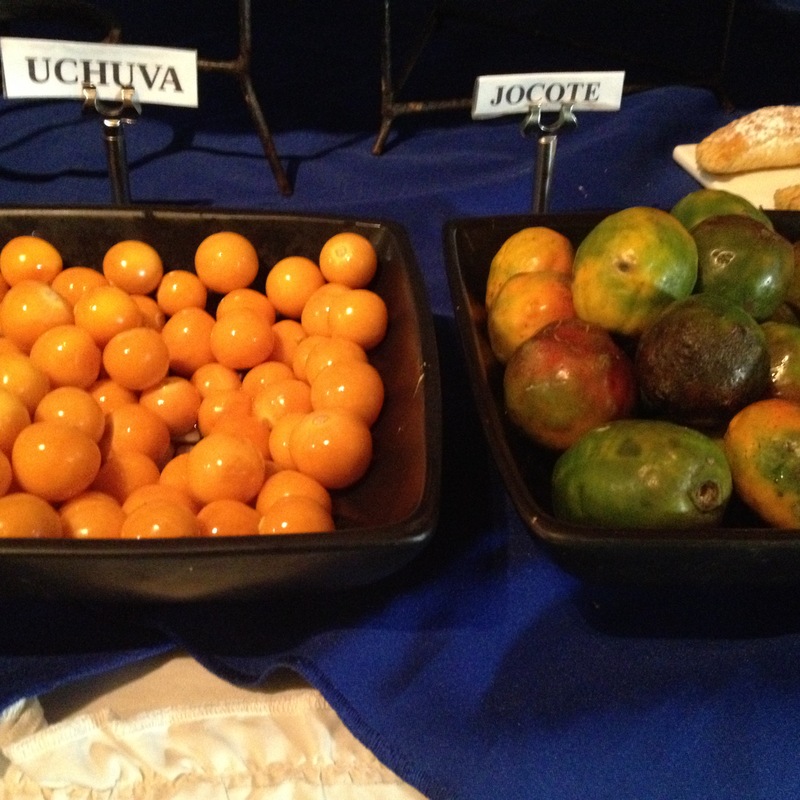 Breakfast was a nice spread of local fruits, some of which will be foreign to many gringos, like uchova and jocote. Not too many “free” breakfasts allow you to order from a menu. We had our choice of 6 or 8 entrees offered. Found that the names of the dishes didn’t necessarily fit our preconceived notions of what they were, however. Huevos rancheros. …. well, they weren’t. Like Tex-Mex in Panama, well, it isn’t. But the fact that we had a choice is impressive enough. With a bit of time on our hands before the bus ride back to Panama, I walked around the hotel to get a better feel for the place. It’s not in the mold of any major chain. Hand-painted murals with tropical themes abound on the mostly tall walls. Pre-Columbian statuary is everywhere. 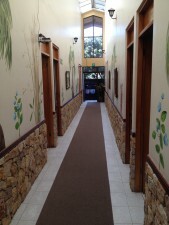 There’s a spacious community area midway on upper floor of the two story building. We used that refunded $25 to pay another Turismo driver to take us to the downtown bus terminal, but this one came recommended by the hotel. The desk clerk said we would be charged fairly, probably $20 or $25USD. It turns out he charged $20. We tipped him $5 in part because he was such a pleasant fellow and we enjoyed his conversation. Also, we were expecting to pay $25. I was right about the outbound tickets. $21 plus $7 departure tax for each of us. I’m sure Costa Rica isn’t the only country to charge a departure tax, but somehow this just doesn’t sit right with me. It’s like charging an exit tax to leave an amusement park, or a theater, or whatever. Whatever. As we were boarding the bus an employee couldn’t help but notice that we’re both on the tall side. In spite of the assigned seats, he offered us two seats behind an exit door. With loads of legroom, it made a huge difference for us on the eight and a half hour bus trip back home. This time for our return trip to the states we elected to go through San Jose, CR instead of Panama City. It’s something we had wanted to do for some time. Just for comparison purposes. As we were able to get fantastic rates on Southwest Airlines, this seemed like a good time to do it. Departure day arrives. After waking up at 1:30 and dozing only briefly for moments at a time thereafter, I was up for good at 5AM. 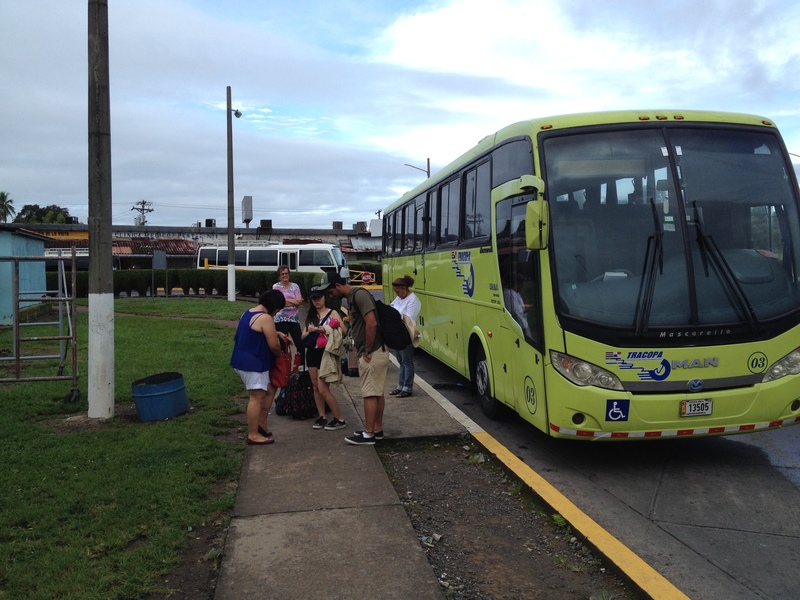 We were on the road before 6:00 and arrived at the David, Panama bus station just after 6:30. A Tracopa ticket window that I didn’t notice earlier had a sign that said “Open at 7:30AM”. That sounded about right for a departure that I understood to be something after 8:00. As we had almost an hour to kill, we decided to have breakfast at a nearby McDonalds. Very glad for that. I hate missing breakfast. As McDonalds didn’t open until 7AM, we arrived back at the bus terminal a bit past window opening time. Jan stayed with the luggage and bought the tickets while I parked the car at the other end of the terminal ($5/day). The tickets cost $20 each but we got a $6 discount, presumably because of our pensianado visas. I’m not expecting the same discount when we buy the return tickets in Costa Rica. The bus left for the border at 8:45, only 15 min late. Our transportation vehicle was much smaller than the David-to-PC buses, and not air conditioned. But we were expecting that. Upon boarding we were given customs and immigration forms to fill out, similar to the airlines. We reached the border soon enough. A short nap helped with that. The bus unloaded all the luggage and we were shown into a thankfully air conditioned room, the only one we would see until we arrived at our hotel in Costa Rica. An official made a roll call of all the passengers and then our luggage was (sort of) inspected. From there we went around the corner to another line. While awaiting our turn a beggar came by with a paper cup. From the looks of things everyone was expected to contribute something. The clerk wanted our passports and our residency visas. But neither of the two forms we had previously filled out. Not sure what department we were dealing with here. We got a passport stamp and our photo was taken. From there we walked about 100 yds to a place that was customs, according to the signage. But the clerk asked for our immigration forms, not customs. Another stamp. A sign at her window indicated requirements for entry into CR but she wasn’t too strict about it, at least not with us. Then just next door (actually, outdoors with a roof for cover), we were reunited with our luggage and waited, and waited, for a non-uniformed lady to eventually show up. Once again, our luggage was sort of inspected. Boarding the bus again we had our luggage checked and were given claim tickets for the first time. Didn’t happen earlier. The guy loading the bags said something about a tip, in Spanish. I pretended not to understand. That didn’t work, so he asked for $2. It remains unclear whether or not that was a legitimate charge. I suspect it wasn’t. Forty minutes or so after arriving at the border, we were on our way again. 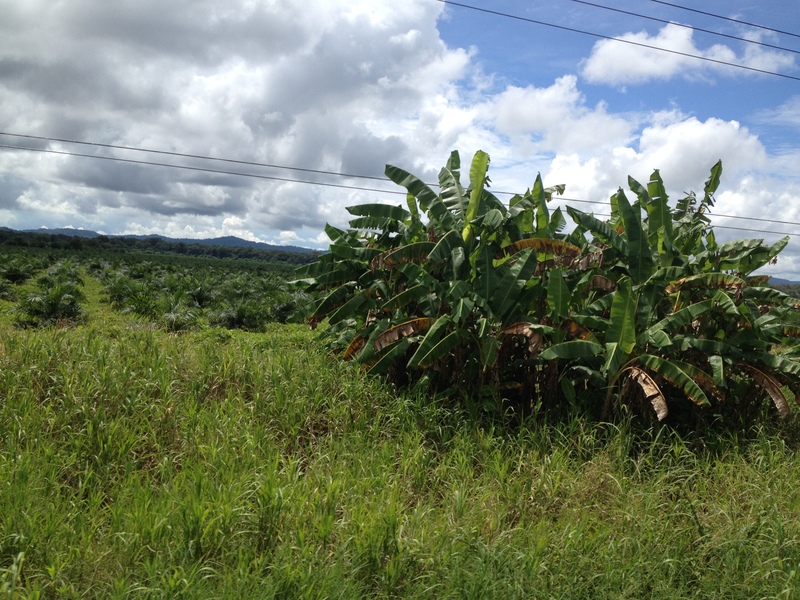 The scenery, for the most part, was the same as Panama, except for vast acreage with palms under cultivation. Later learned they were harvested for palm oil. Stopped for lunch at Flor de Sabana around 12:30 . Cafeteria style, two of us ate for something under 10USD. Beer, as an afterthought, was another 2.26USD, or 1200Colon. More than twice what I would have paid in Panama, but worth it at the time. It may have been an n/a beer, as I’m a cheap drunk and I felt nothing, despite it being consumed midday. But it tasted good. In half an hour, we were back on the road. 3 hrs to go, +/-. Refreshment and pit stop around 3:30. Small bottle of tea, small box assorted candies, peanut brittle bar, small ice cream sandwich came to $8. Ouch! 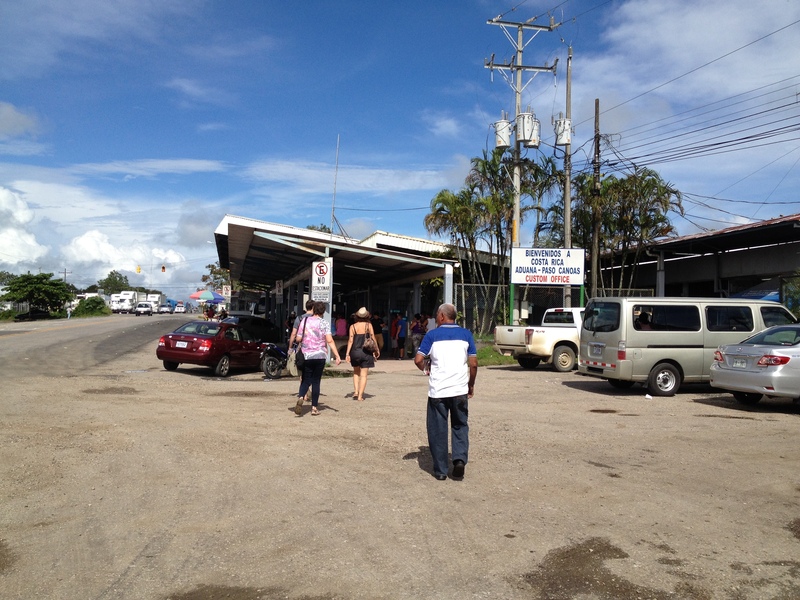 It was nearly 5:00 when we finally arrived at the bus terminal in San Jose. The cab ride from there was a nightmare. It was rainy and we arrived at just about the worst time for traffic. It took an hour and cost $40. Finally at the hotel (Holiday Inn Express) I was feeling smug that I’d thought to bring along some rum. Couldn’t wait to get a Coke and r-e-l-a-x. Incredibly, the Coke machine wanted $2! I know that sets a record for the amount of money I ever put in a Coke machine. Following a refreshing drink or two … or three … we walked over to a Denny’s for a minimal dinner. That came to over $30. Next morning we’re up at 5:00, per Jan’s arrangement with the front desk. I’m in the shower at 5:15 suddenly questioning why I’m up so early. It turns out Jan thought our flight left a 8:00. In fact, it’s scheduled for 9:00. Now we’re waiting for the dining room to open for breakfast at 6:00. The San Jose airport was a delight. Smallish, but big enough. Not at all crowded. Things moved fast and progressed smoothly. At least until we reached the boarding gate. Like PTY in Panama City, there is yet ANOTHER luggage inspection before boarding the plane. So far I’ve not been able to determine the reasoning behind this. The inspection was so casual I wonder why they even bothered. And not a single Muslim on the flight, as far as I could tell. Maybe that’s why it was so casual. 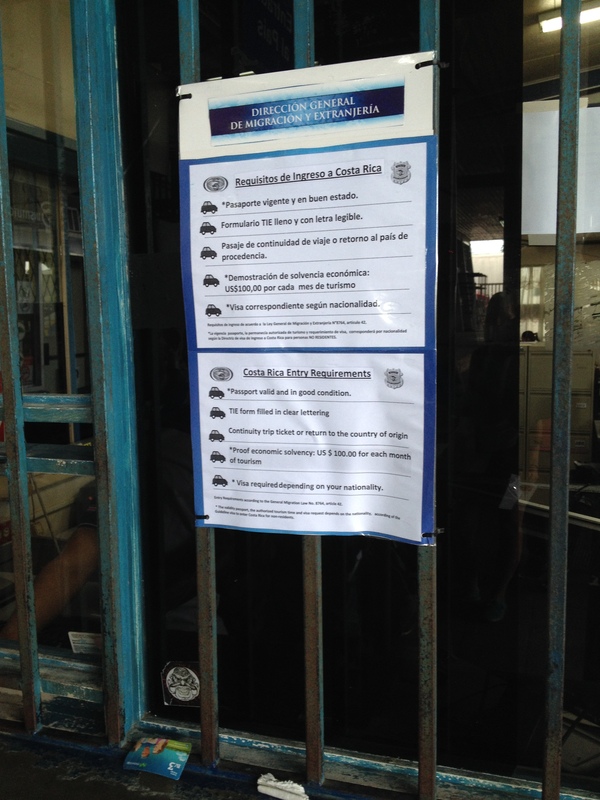 There was an e-mail announcement this morning of a new medical clinic in Boquete. Among other things, it really highlights the differences in medical practice between here and the states. To start with, she (the doctor) publishes her office phone AND her cell phone, with the note that she’s available 7 days a week, 24 hrs a day. AND she makes house calls. How’s that for starters? Then she goes on to list specific services such as injections, emergency sutures, medical certification for insurance, etc, etc. I guess we’ll have to make up some excuse for an office visit just to check out the doctor and her facilities.. It’s best to not wait until something is really needed. The container arrived a month ago and we’re still trying to put things away. We had a garage sale of sorts last Saturday and got rid of some excess merchandise, but with space and time limitations we weren’t able to display all of our offerings. And I knew from the git-go that would be the case. We’re already planning another sale before Christmas. We have a considerable quantity of Christmas items that need to go. We both have a lot of accumulations from over the years. If someone from outside were to come along and throw away 90% of it, we’d likely never miss it. But when being personally previewed, the items tend to take on an exaggerated importance. And I’m far worse about this than she is. 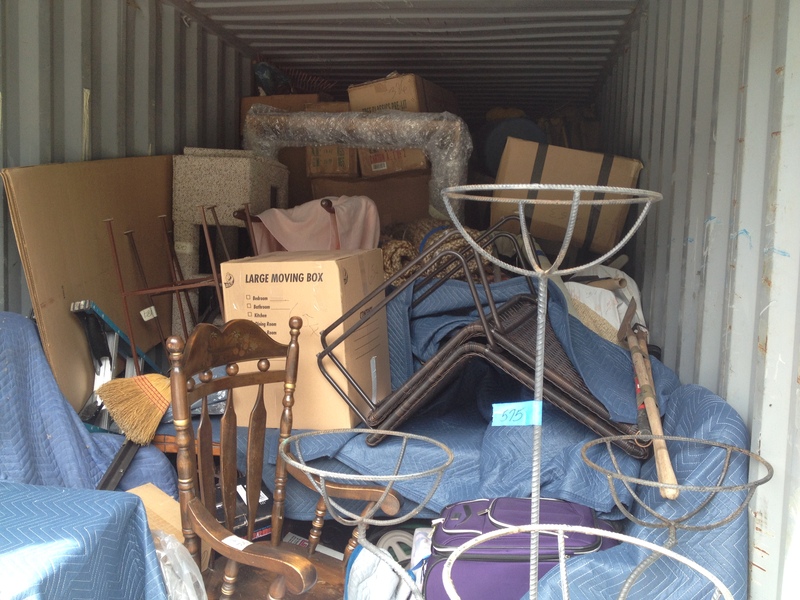 The container was picked up from the storage units on Monday, July 6. The paperwork we had in hand indicated two weeks in transit. Seems like a long time to go from Galveston to Colon. A cruise ship could make it in a day or two I’m thinking. A follow-up later from Panama indicated we should have the container on July 22. What we actually got on the 22nd was a request for more money. Something about fumigating and storage. We made the deposit in the local branch and sent a copy of the deposit slip the same day. The following day an email told us to expect a call on Saturday, the 25th, to discuss where to land the container. On Friday, the 24th, we received a call that said the container was in Boquete! We needed to find the driver and direct him to a landing spot. Needless to say, we were a bit unprepared. The guy and his brother that we were going to use for the unloading were off on another job. We drove up to our neighbor’s place soliciting his aid. He’s been here a number of years and knows his way around. Also, he’s truly bilingual. Not just a smattering of English or Spanish. After considering the facts and the circumstances he recommended we talk to a local car repair shop owner. He was known to have a large flat-bed wrecker that could unload the container “in two trips”. I knew the guy from previous service work on our car and was well-pleased with him. Turns out he was amenable to unloading and delivering our goods. He wouldn’t give us a price as he didn’t know how long it would take. But he would be “fair”. Now we had to find the driver with our container. He was a long way from where we were originally told he was, but we did manage to find him. We drove to a landing spot recommended by our neighbor with the wrecker driver in tow. It would be about 5 km from our home but we all agreed there would be nothing closer. We live above and beyond a very winding and fairly steep road. I was reasonably pleased with the first load of goods up to our place. It took scarcely an hour to fill the flat-bed and get to our house. Unloading was a bit faster than loading. By now word had gotten to Carlos, our young neighbor that handles all sorts of small jobs for us, and he and a cousin were up at the house when the first load arrived. We asked the wrecker man if he wanted two more helpers, in addition to the one that he brought along, and he enthusiastically did. It took not one more but two more loads on the flat-bed to empty the container. And by the time they’d unloaded at our place, it was 7:30PM! I don’t know where the time went. Later, I was pondering why the first load went so fast and the second two took so long. I may have gotten my answer when I got the bill. He was charging $80/hr for nine and a half-hour’s work! That’s not even counting the two laborers that we provided. Actually, he tried to charge me for ten and a half hours, figuring that was the time between 10:30AM and 8:00PM. When I called him on it he said that he would re-figure. Nope, that was right. 10.5 hrs. I gently but firmly said, “No it isn’t. It’s 9.5 hrs.” Again he referred to his watch and started counting. Again he came up with 10.5 hrs. He was going to “show me”. He counted from 10AM to 8PM and came up with 10 hrs. I agreed that was correct. He said, “then add 1/2 hour” because it was 30 min “more” than 10:00. I said, “No, you subtract 1/2 hour, because it’s only 30 min from 10:30 to 11:00. ” He was quiet for a while then agreed that I was right. This ranks right up there with an event I remember years ago on St Croix. I got $8 worth of gas at a self-serve gas station and paid with a $10 bill. The clerk pulled out a calculator to figure my change! Incredible? Yes, but it actually happened. The quality of the work was somewhat disappointing, but I guess it could have been worse. Over the years international symbols have been developed to get around language barriers and to accommodate, well, … the mentally challenged . But sometimes it’s just to no avail. Several items were broken, even more were damaged. Only the expensive stuff, of course. Some was broken in transit, some was broken by the wrecker driver’s crew and some was broken by culprits unknown. The decision to move our stuff down here was not made lightly. And we knew that some damage and loss was sure to occur. We’d heard stories of others who went through this before. Some were overall happy with things, some said they’d never do it again. For our part, we’re happy to have our stuff down here but we’d never do it again. 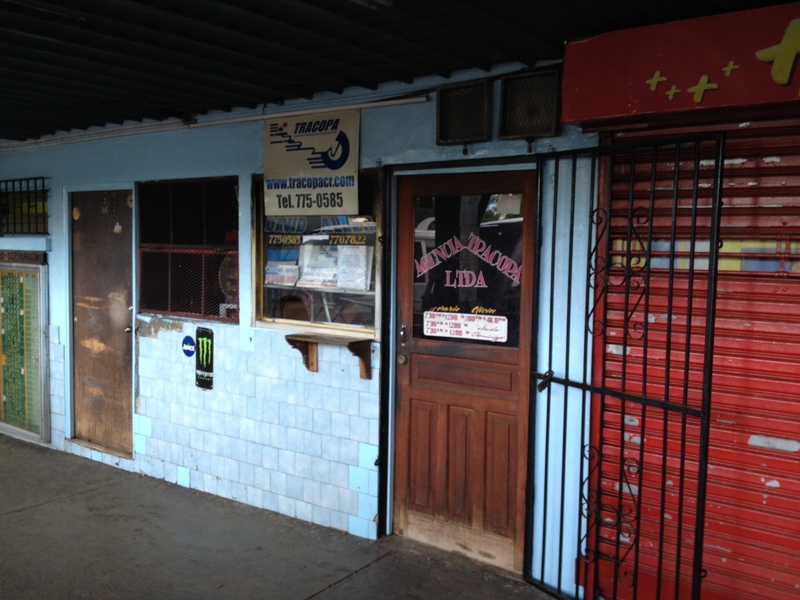 We had been in Panama almost a year before I acquiesced and agreed to shipping our worldly belongings here. By that time we had spent on storage an amount approximating the cost of shipping. Also, maybe primarily, it was increasingly looking like we were in Panama to stay. We lightly considered selling our possessions while still in the states, but that didn’t happen. And at this point that was no longer an option. We made this decision to ship shortly before an already-booked trip back to Texas, the purpose of which was to make ready for sale the last of my airplanes, vestiges of my days in the Caribbean. By now we were aware of the requirement to have all shipping boxes numbered and inventoried, something that made the whole shipping process considerably more difficult. I guess it should have been common sense, but it never occurred to us. On the earliest boxes stored, we had listed the contents, but none of the boxes were numbered. And scarcely half of our possessions were properly boxed for shipping. I had no unrealistic plans or goals for accomplishment in the day or two I would have available to address this situation, but I could get a good feel for what was involved. 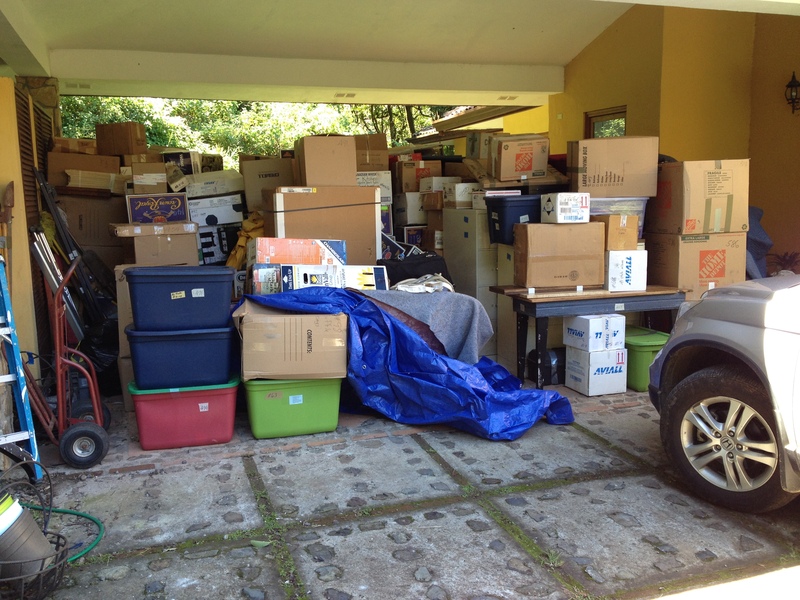 Starting with major items that were not yet boxed, it soon became apparent that this would be no walk in the park. I got maybe the first 30 boxes numbered and inventoried on a spreadsheet before my available time was all gone. It was to be another six weeks before I could get back to Texas. Not intending to leave until I had the container ready for loading, I left Panama without a ticket for the trip back. Anxious as I was to get the packing squared away, dealing with the airplane was still the number one priority. I ended up devoting my first two weeks to the plane. A pattern was soon emerging. Everything I tackled was taking about twice as long as expected. When I left Panama I thought vaguely of returning around the end of April. In fact, by late April I was just finishing with the plane. To add to the pressure, still light at this point, my lady had scheduled a trip of her own for the 22nd, more than three weeks away. Shouldn’t really be a problem, I thought. Yeah, right. About a week before her scheduled departure things were looking really iffy for me. Not wanting to wait until the last minute to buy my airline ticket, I booked a flight that put me in Panama the day before she left. As the departure date neared, I thought just one more day would see me finished. But alas, rescheduling for me would be easier than rescheduling for her. At this point, the boxes inventoried and labeled numbered exactly 400. Five days after she returned from her trip, I was on my way back to Texas. I allowed two weeks for what I thought would be, at the most, one week of work. In fact, I was hoping to be finished in only a day or two. Uh uh. Clearly, I would finish within the time I’d allotted but the 2 week allowance was prudent. I decided it wasn’t excessively reckless to take two days off on the first weekend of my trip. My grandkids had planned a Fathers’ Day gathering at a lake house with their father, my son. All three of his kids and all of their mates/significant others would be in attendance, as well as the first grandchild and great-grandchild that I’d seen on only one other occasion. The reunion was a rare opportunity these days. Everyone is scattered all over the state. And beyond in my case. Too bad my daughter and her family weren’t there as well. Except for the kids in Austin, her family will remain away 2,000 miles and more until early fall. Not coincidentally, our storage units were very close to the house we moved from. (Yeah, I know. that should be “the house from which we moved”. Please see disclaimer under “About the blogger”.) Our former next door neighbors were kind enough to provide me lodging until I returned to Panama. Only 1/2 mile away from the work, their home was extremely comfortable, convenient and efficient. We had four storage units in total. Three 10×10 and one 10×20. They seemed filled to the gills. Thinking that I was almost finished with box number 400 turned out to be just a bit optimistic. The final count ended up at 655. With the end of packing in sight, I began to wonder whether or not everything would fit in a 40 ft container. After careful consideration, I concluded that if the container were properly loaded, ie with boxes to the ceiling and absolute minimal voids, it could be done. Turns out the guys loading it did a great job and I realized early on there would be no problem with space. And there wasn’t. 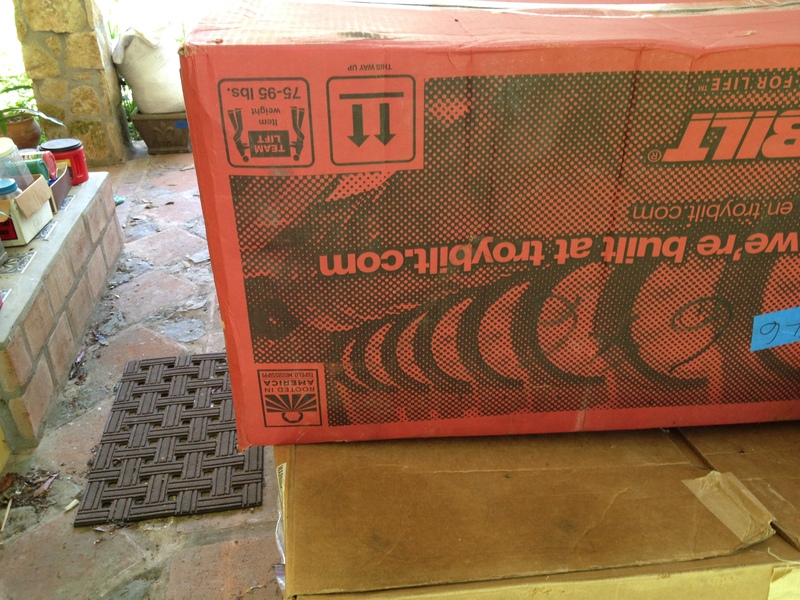 The container was to be picked up the following Monday and I was soon on my way back to Panama. In a few weeks, more or less, the whole process would be repeated in reverse. Oh, joy. Rico, born feral but he won the lottery. Just 8 days ago my true love presented me with a kitten for my birthday. She didn’t have to spend much time shopping. He was found at a monthly spay & neuter clinic that we both work at. Many times feral animals are trapped and brought in for this minor surgery in an attempt to keep the hungry and starving populations down to a minimum. There are always cats and kittens, dogs and puppies, available for adoption. A few, a very few, are adopted. Many more are not. The volunteers who work these clinics almost always have enough animals already. And almost no one from the general public shows up at these events with the express purpose in mind of adopting a pet. For a feral animal to leave here for the food and comfort of a loving home is, regrettably, a relatively rare occurrence. But that’s what happened to Rico. He not only went home with a loving family, he went home with US! Life does not get any better for a cat. He indeed won the lottery. It didn’t take long for him to irreversibly worm his way into our hearts. Maybe a few hours. He came to us with a couple of good-sized wounds on his head and throat, probably from other, bigger cats. The little guy we brought home was maybe 5 wks old and 3 lbs or so. He loved to eat, every few hours suited him admirably. He seemed accustomed to having his meals few and far between! Reminded us of another cat we rescued 4 years ago as a starving kitten. Cinco could not and still cannot get enough to eat. Rico feels the need to constantly look back over his shoulder when eating. A lesson learned no doubt in the feral cat community. There was always some bigger guy looking to take over what he had. Late morning today my lady commented that Rico must be growing up. He’s not in her lap or otherwise right at her side as he usually is. We thought little of it. A couple hours later we realized he hadn’t made his presence known for a while. Surely he must be hungry by now. We called and got no response. We called again and got no response. He ALWAYS responds when we call as invariably that means food is at hand. But he didn’t answer. We looked all over the house and couldn’t find him. I began to think the worst. Many years ago a young kitten that we had taken in managed to kill himself in a most freakish accident. I’m fearing the same thing again. Rico is NEVER quiet for long. I began pulling out and looking behind electrical appliances. Refrigerator, dishwasher, laundry room appliances. No Rico. Pulled apart the couches, recliner, furniture. No Rico. We did this not once but MULTIPLE times. No Rico. My love realized that the sliding window above the kitchen sink was open just a bit. This was a new arrangement for the “big” cats when we brought Rico home. Up to then we left one of the sliding doors open for their happy ingress and egress. But I never saw Rico even up on the kitchen counters much less near the open sink window. Still, my gut told me that if he was still in the house he was somehow dead. We went outside in a light drizzle looking and calling. Calling and looking. I knew our only realistic chance was to lead him into answering our call. He always did that readily. We live on the edge of a rain forest. A jungle if you will. We never realized how many sounds came from the surrounding woods that COULD be, MIGHT be, a cat. But they always disappeared before we could track them down. We came back in the house and repeated the search procedure we’d done already several times before. Then we went outside and repeated that search procedure, covering our entire perimeter and beyond. No Rico. We were both just sick, almost physically sick. It had been fully 6 hours since we last saw him. Not an event for the other cats but we were accustomed to having Rico around every few minutes. I went down the drive to do some gardening work with the added hope that I just might hear him meowing. After maybe 20 minutes my lady called to me. “I have him!” she cried. Could it really be? I thought not. Surely I just heard what I wanted to hear. But when I got to the house, there was Rico in her arms. She had been sitting in her favorite recliner when Rico just came nonchalantly sashaying up. She has no idea where he was all that time but she was confident he hadn’t been outside. He was clean and dry. We will puzzle over this for a long time. We repeatedly searched our home from top to bottom without success. Where could he possibly have been? Predictably, Rico was ravaged. The chunk tuna we offered him was most graciously accepted.